It all starts with Halloween decorating! Whether you are hosting a party, or just decorating for the trick-or-treaters, it all begins with the outside of your house and the front yard. If you are hosting a party, the outside of your house sets the mood for your guests as they walk into your haunted house. If you are just decorating for the trick or treaters, the front yard is all they will get to see so, read on to find out how to set the mood of a scary atmosphere! Let’s start with the basics: tombstones, spider webs, and jack-o-lanterns, and scary music! I love the look of carved pumpkins, lit from within. They add so much to the whole look of your house, and they work well inside or out. If you have several of them, even better! 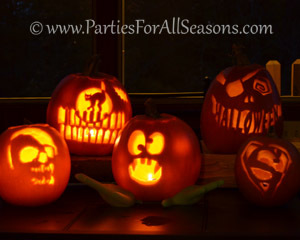 If you are hosting a party, ask a few close friends to bring along their jack-o-lanterns for that night (they can take them home when they leave) because having a bunch really looks great. Pumpkins that are not carved look great too! You can decorate your front yard with some haystacks (available at farmers markets, and some supermarkets) and place pumpkins around. This decoration is great for early Fall all the way up to Thanksgiving. 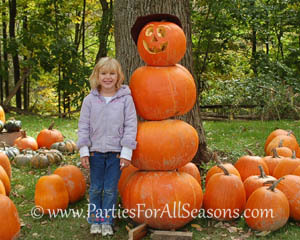 You can also try stacking the pumpkins to make a pumpkin man! I also think every yard needs spider webs. Don’t buy the really cheap ones; look for the packages that say “super stretchy”. These kinds spread better, whereas the cheap ones look more like cotton. The key to making these look real is the spread them out good and avoid having clumps. Put these in trees, in the corner of your house and by the front door. 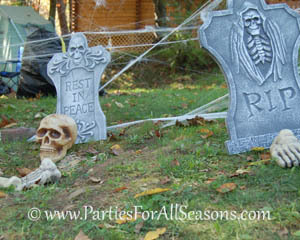 Creating a graveyard is easy to do and gives you something to do with the blank space in the middle of your front yard. Tombstones are easy to make or buy. To create some, buy some one inch thick foam board, or use plywood. Cut out tombstones shapes using a jigsaw and then spray paint them gray. They make spray paint which looks like stone, and this type of paint looks great on these. You can then use a black Sharpie or black paint to add on epitaphs. You can add spikes in the bottom of the tombstones (unbend a coat hanger, for example). If you have foam tombstones, these can be inserted in the bottom of the foam. For wood tombstones, they can be secured using some hardware. I have also had success by propping the tombstones up with bricks behind each one. This works well if you are only setting this up for one night (and it isn’t too windy out!) Remember to put some spider webs around and between each tombstone. Skulls or bones also look great lying around the tombstones. You can add a pile of fallen leaves in front of each tombstone as if it is a “fresh grave”. Now on to some extra ideas… other ways to decorate the outside is to line your driveway with lighted luminaries. You can make these out of paper bags weighted down with a few rocks or some sand. Placing a battery operated votive inside creates a mysterious lighted pathway up to your door. 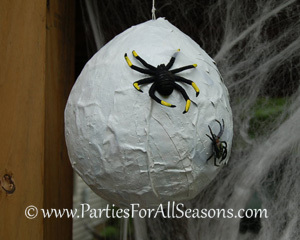 You could also make a spider nest to hang by the door, how creepy! My sister’s family decorates with dummies around the yard. Their yard always looks great and she tells me that it isn’t hard to do. Grab some clothes (a pair of jeans, and a flannel shirt, for example) and stuff them all up with newspapers. Don’t forget shoes and gloves. Put a stick into the shirt, and then place a mask on top of the stick for the head. 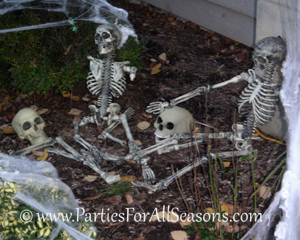 These bodies can be sitting in a chair where you pass out candy, or laid out by the tombstones like dead bodies. I purchased four skeletons with bendable joints one year from Terry’s Village. It was my best Halloween purchase ever, because I use those skeletons every year. I love how you can position them to be sitting, standing, holding something, whatever. I even used them to decorate for my daughter’s pirate birthday party. Skeletons definitely add to the whole look! Let’s move on to the inside of the house. If you are having a Halloween party, it is no surprise that guests tend to congregate in the kitchen. Why not decorate the kitchen to match the theme? One year, I decided to make my kitchen look like a haunted laboratory. I was able to borrow some Erlenmeyer flasks and test tubes from a real lab. I filled them with water that I colored with food coloring. I filled the test tubes up with milk I had dyed red to resemble blood. I put biohazard signs up all over the kitchen. I made up jars of “specimens” and placed them on open shelves in my kitchen for all to see. To do this, I found some plastic animals my kids had (for instance, a rubber mouse, a bouncy ball that looked like an eyeball) and put them in a jar filled with water. The water can be turned a light brown color by adding a teabag for a few minutes. You can make a spooky label and glue them to the jar. I even put some of these creepy jars in my medicine cabinet of the bathroom, just in case someone was being a snoop! If they were peaking around, they got a surprise! 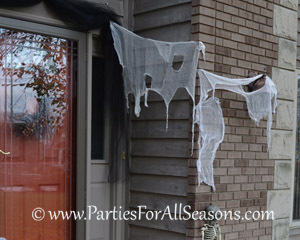 Another Halloween decoration that adds a haunting look is cheesecloth window treatments. You can drape these old ratty cheesecloths over furniture, across windows, and even drape on tree branches. 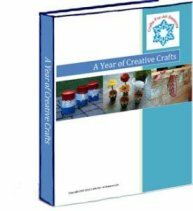 To make them, go to your fabric store and buy several yards of cheese cloth. Pile the cheesecloth in a bucket, and fill to the top with warm water so the fabric is completely covered. Add a few tea bags and let the solution sit for a few days. Remove the cheesecloth and allow it to dry (without rinsing). The tea water yellows the cheesecloth to make it look old. Pull at the cheesecloth to rip a few holes in it. 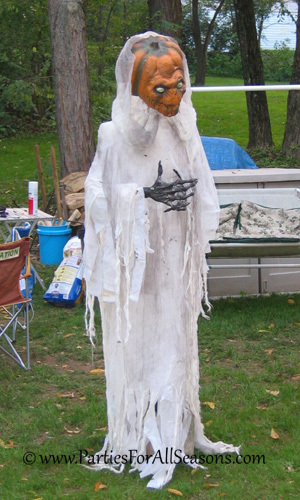 This material is such a universal Halloween decoration and can be draped over anything to make it look instantly scary!